"Linda was a nurse for 27 years prior to her retirement into nursing home as patient for the past 9 year, in Kissimmee, FL. She was not mobile, her legs ached and were severely swollen plus could not get around anymore, need to walk in a walker, primarily spends most of time wheel chair. Started the first night with LASERwrap on right leg by the next morning she felt some relief. Her swelling was down and was able cut down supplement morphine daily from 5-6 tabs /day to but 1 in the evening. She would much rather have LASERwrap over morphine. After being a nurse for years and as for her own pains, a day and 1/2 later, she definitely wants LASERwraps over all the alternatives. “My faith and hope lie with LASERwraps." "This patient after being seen by wound physcian for 4 months in sounthern Florida was moved to Osceloa nursing Center in Kissimmee where the LASERwraps were applied. After two weeks wounds closed over 75% and after 3 weeks were completely healed along with the pateint’s bedsores on her torso." My name is Chuck G. I’ve been using the Spectra Cold Laser for 6 months to relief of several symptoms related to Multiple Sclerosis. I wore the laser around my ankle while at work and while sleeping, switching ankles every twelve hours. After a week I noticed increased feeling and movement in my toes. After wrapping my waist, two weeks I was able to urinate much easier and was able to sleep all night without waking up to go the bathroom. After two and a half months these symptoms have continued to improve and I was able to eliminate one of my supplements that promoted urination. 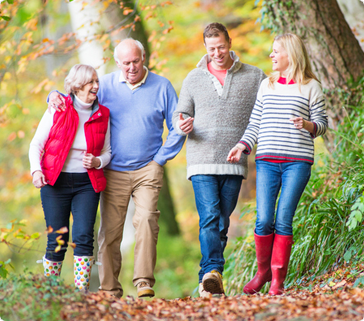 I look forward to even more improvements with my symptoms using Dr. Sarah’s guidance with the correct supplements and use of the Wearable Spectra Therapy Cold Laser." "I pulled the ligaments and tendons in my ankle. The doctor told me that it would be 4 months until I would ride again and 6 months to a year before I would quit being in any sort of pain. 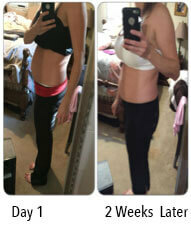 I used LASERwrap® 2 hours a night for 1 week and then once a day for 2 more weeks period. When I went back to Doctor he could not believe it I was back riding in 30 days and had no pain by 45 days at all." "After trying Ibuprofen for 1 month rolling exercises for a month, then a boot keeping foot at weird angle, tried exercise after another couple month at end, did not want more injections, heard of cortisone as well. Then Dr. Chappel became aware of the LASERwrap and introduced to me. I wore LASERwrap 3 days, for twice a day for 8.5 hours periods, after week it was going away, 2 weeks felt perfect, could wear any shoes that I had not worn for months." "I used the laser 2-3 times a day for about 30 mins the first 3 weeks after labor, and twice a day for 30 mins after 3 weeks. I can tell a HUGE difference in my body as you can see in the pictures. Let me add, I have done NO diets or exercises after I had my baby. I do believe it made me heal much faster than normal! My postpartum bleeding was only half the time they estimated from the hospital, my hemorrhoids shrunk quickly and they are hardly even noticeable anymore and never hurt, I also tore from my delivery and had to get stitches which healed much quicker than they told me they would and I was never sore from them. I also used it on my back because I got so sore from the epidural and it eased the pain instantly when I laid on it. I would definitely recommend any postpartum mommy to use these lasers to heal faster and to reduce soreness after child birth!! I truly believe it was what helped me bounce back to myself. Let me know if I can do anything else!" Improved circulation helps firm up stretched skin tissues caused by pregnancy. Help too for recovery from tummy tucks or hernia surgeries. FDA cleared to reduces muscle spasm stress tension and gas issues caused by stress. 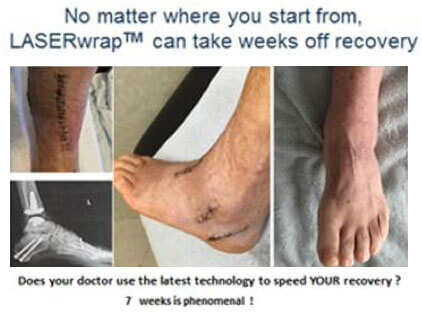 "LASERwrap® accelerates wound healing in 3 weeks versus several months as projected by physician." "I used the machine myself, on my knees. I have terrible knee swelling and pain when I ride a lot of horses. Normally I ice and take supplements and have even had both joints injected in both knees. I felt a huge difference, if I treated myself regularly. I would do 2 or 3 treatments on the blue program at night before bed and sometimes once in the morning before riding. I had little to no knee pain when I would do the treatments. I took a break from the treatments to see the difference and was back to having pain again. After resuming the treatments I again have relief and can ride 7 or 8 horses a day with no pain"
"At age 37 years old I was diagnosed with rheumatoid arthritis, RA, which was about 2 1/2 years ago. The condition mostly affects my extremities, hand, wrist, toes, feet, ankle, but also my shoulders. I use LASERwrap® to help manage the pain and to prevent my joints from locking up. I wear the dual filament wraps for 1.5 to 2 hours or I sleep with them on. Wearing them while I sleep help me to prevent my joints from locking up along with waking up with night pain. The most significant benefit is that I don't have the night pain when I use the lasers on a consistent basis. I also have alot of pain in my right ankle. Leaving the wrap on all night, helps reduce the edema and pain. I get pain relief wearing the wrap on my shoulder also. 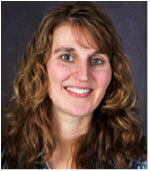 LASERwrap® reduces my need for pain medications." "Easy to use to for multiple horse riding injuries ranging from tendons and twisted ankles in a few weeks to the LASERwrap healed my psoas muscle – and lower back- the only reason I could get back to riding a horse in 6 weeks. These LASERwraps are AMAZING." "I use the LASERwrap kit extensively during training for Iron Man event - warm up, cool down and around the house during recovery. No more painful ice baths I used to spend time and $$$$’s for various chiropractic, acupuncture, therapies, spine doctors and podiatrists for ankle & foot pains. Now I reach for the WEARABLE LASERwrap." "In between half marathons and in training sessions and I developed sharp pain, in the bottom of my foot. Drop by a physician office took advice and tried the LASERwrap on my foot. I felt relief the next day, after 2-3 day of treatment pain was all gone, and I went on to run ½ marathon pain free. See recommending this product any time one pulls or strains something as well as to get rid of lactic acid and cool down after a marathon." "I’ve been using the LASERwrap since May, 2014 The LASERwrap has helped me immeasurably since I shattered my medial meniscus. When I need prompt pain relief, the LASERwrap provides it." 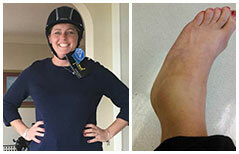 "I am a 37 year old female with diabetic neuropathy for approximately 2+ years in my feet and legs as far up as my knees. I have lost all feeling in the tips of my toes with severe pain shooting through my feet as well as feeling like someone was yanking off my toes. My neuropathy medication only helps a little. Shaving my legs brings me unbearable pain, a task I had taken for granted. About 3 and one half weeks ago I began using the Spectra Therapy laser wrap. The first day I wore the wrap around my ankle on the 12 minute cycle the entire day. That evening around 5 pm I pulled The Spectra Therapy laser wrap off and allowed it to charge fully. That night I wrapped my entire foot and looped it once around my ankle and went to sleep for about 7 1/2 hours, while the Spectra Laser did its magic. When I woke I did my normal routine, took a shower got dressed and ready for work. As I was getting dressed I felt this soft, cool feeling on the bottom half of my legs. It took me a minute to realize it was my pants... Yep I have not felt my pants touch my legs without pain in 2 years and actually identify the feeling was my very own pants. About 20 minutes after my shower I had realized my feet were not in their usual pain. As the morning continued I was not having any pains in my feet, no burning and no stinging. I was ecstatic with these results just after one day of using the Spectra laser wrap. I noticed that while the wrap was on and doing its magic I could feel a warming and mild vibrating sensation. Now after 3 weeks of using this wonderful creation, my feet are not 100% gone of the neuropathy, but I can say I am not taking any medication for it now and I only get mild burning/stinging after being on my feet for 8+ hours at work. I get home put my laser wrap on for about an hour and I am much better. I do occasionally wrap my entire feet while I sleep. I do believe whole heartily that this product can help so many people with this horrible consequence of diabetes. It has changed my life. I can enjoy so much more by not concentrating on how much pain my feet and legs are in. 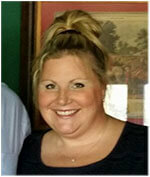 I look forward to seeing how much more the Spectra Laser Therapy can change my life." 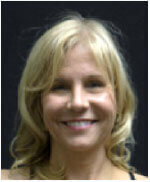 "I have been using Spectra Therapy Lasers in my office for over a year now. They benefit my patients and my family. They are good for sprained ankles for the high school hockey wants to be back on the ice in a few days! and not want to miss a game. They improve circulation by decreasing the density of the blood and increasing the oxy-generation of the blood. 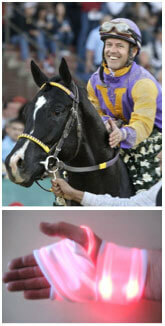 I was introduced to Spectra Therapy Lasers by a friend who uses them daily on horses she rehabilitated. I saw some amazing results involving the healing of tendons, muscles and open wounds ina short period of time. I have been so impressed with the results." Stiches healed 7/9 - LASERwrap daily first 3 weeks, - used day & night. After 7 weeks, walking strength progressed. 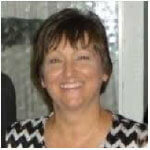 By 4th month I was able to reengage with my golf clubs without any discomfort." "On Feb 18, released to walk with a boot. By March 8, I was able to walk without the boot. My doctor was very impressed with the speed of my recovery. I continued with Laser Wrap for the next month which helped reduced pain with my need for physical therapy. Released by my doctor on May 17. The total time from injury to complete recovery was 19 weeks. I firmly believe that the Spectra Therapy laser therapy greatly contributed to the speed of my recovery as well as increasing my comfort during the healing process." "I use the full body pad on each massage client. I place the body pad under the client on the table before their massage. It is my experience by doing so my clients have less soreness after the massage. I believe it is since I use the Spectra Wearable Laser pad as I massage it moves the lactic acid out much quicker. For greater results!" "For 6 1/2 years I have struggled with back pain due to a herniated disc (L4-L5 & L5-S1), arthritis and degeneration in my spine. I have tried everything short of surgery. My days consisted of searching for pain relief through various methods such as: steroid shots, chiropractic, massage, acupuncture, yoga, medication, LED, ice packs and various types of physical therapy. It was consuming my mind, my time and a substantial amount of $$$$. After using the back LASER wrap for only 3 nights, I have noticed a significant difference in my sleep quality and I now wake up pain free. I also found that I was better able to endure the physical therapy, since it reduced the pain and allowed me to better perform the required exercises, for muscle building which should then properly support my spine." 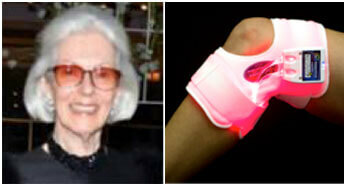 "I have been using the Wearable LASERwrap® for on occasion for an intermittent pain problem. The pain extends from the outer portion of my hip to the area on the outside of the knee due to the sciatic nerve being pinched. This usually occurs during the night while I am sleeping and awakens me, at which time I immediately put the Laser Wrap around the knee falling back to sleep and will continue wearing it during the day. The LASERwrap® provides immediate relief and the pain subsides completely within 24 hours. 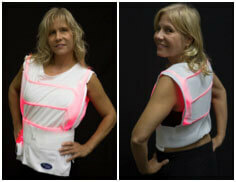 I highly recommend this product"
"The SPECTRA THERAPY LASERwrap! Amazing product. As a victim, wearing the LASERwrap in bed has been a God sent. It has substantially reduced pains and swelling in my lower extremities, enabling me to get a decent night’s sleep. Ruby M., former Rehabilitation Director at "Select Medical"
"I used WEARABLE LASERwrap Vest for 2 weeks, - It substantially reduced flem in my chest and lungs within a week , and by two weeks , increased SPO2 by 3% , effectively stopped coughing episodes , and muscle spasms caused by the decease. Here is a tabulation of the benefits which I found." "On May 3rd, 2014 I sustained a hand injury that left my hand with multiple fractures, spiral fractures and hyper extended joint capsules in my fingers as well a dislocated wrist. After surgery, doctors stated it would be a year before it was usable. During the first 2 months I experience a wide range of rehabilitation and therapeutic procedures. I was told on several occasions to be patient and not expect to return to work until sometime 2015. I then was introduced to Spectra Therapy’s LASERwrap and found it helped accelerate my healing process. I noticed immediately the blood flow more effective with the circulation in my hand as I could wear the portable unit while active or inactive, even while I slept through the night. I was able to feel I could work the hand and wrist harder during therapy sessions. I was released by my Doctor to ride professionally in late September 2014, and evaluated by my surgeon and his staff of doctors that all commented how rare and amazing my recovery had been. 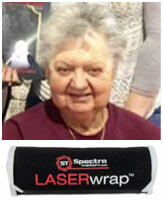 Spectra Therapy’s WEARABLE LASERwrap was most instrumental." "Spectra therapy is a miracle product. Every household should have one. Last January I developed tendonitis in my left hand and it was very painful just to lift a quart of milk or to sew and sewing Is my lively hood so I was in a tough situation. For months I had chiropractic treatments including ultrasound with little results. After suffering for four months, I was referred to hand clinic for possible surgery, injections and drugs. Fortunately I was given the opportunity to try the Spectra Therapy LASERwrap. I HAD RESULTS IN THREE DAYS and total relief after only two weeks, and have been PAIN FREE for ever since. During that time I also burned by thumb and forefinger on a hot grill. The same successful results as the tendonitis. Amazingly the burns healed in a couple days, with no blisters, scabs or pain. I was finishing my treatment in May, when my black Lab dog Spike came down with anaplasmosis, a tick infection. All of his joints were inflamed and he couldn’t even walk or get upstairs without help. I used the LASERwrap on him as well, wrapping it around his back and abdomen. Today he is running and jumping like a puppy. HE is almost 4. I can’t thank you enough for this life saving product. Every house hold should have one." Can be debilitating but with LASERwrap it helps solve the problem by treating it and pain goes away. Ticks and autoimmune decease anaplasmosis. "Ate a hamburger on day 3 , with extraction sites closed , had reduced to pin holes"
Heals quickly less infection plus comfort less pain.